Originally appeared on ROI-NJ on May 28, 2018. 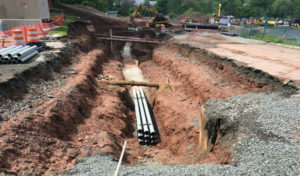 Infrastructure work, including road construction and sewer and storm water systems installation, has begun at the ON3 campus in Nutley and Clifton. Road and infrastructure work has begun at the ON3 project, the former Hoffmann-La Roche campus in Nutley and Clifton, according to developer Prism Capital Partners. Prism said in a news release Friday that the nearly $10 million first phase of work includes the addition and renaming of streets on the east portion of the 116-acre campus, as well as installation of new sewer and storm water systems and a rewiring of Public Service Enterprise Group’s connections to the campus electric grid. A 10-megawatt onsite cogeneration facility is also part of the project, as is comprehensive streetscaping and landscaping. The medical school is one of the showpiece elements of the revitalized campus, which formerly housed a major Roche facility that closed in 2012. Other companies linked to the campus include Ralph Lauren, Quest Diagnostics and Modern Meadow. Main Street through the complex has been renamed Metro Boulevard, while the former Fifth Avenue is now Ideation Way. That street will be rerouted, with a new connection to Nutley’s Kingsland Street providing additional vehicular access to the campus. Prism said this work is expected to be completed in July. The project straddles the border of Nutley in Essex County and Clifton in Passaic County.